For someone who only eats a decent breakfast on the weekends, I have a good collection of yummy recipes. I love breakfast, however, during the week I get up too early and just don’t have the time to prepare a large meal. I usually opt for something light and healthy like a fruit protein smoothie. By the time the weekend rolls around I am ready to do it up right!! So for this weeks Fiesta Friday, that’s right I said Fiesta Friday!!! WhooHoo! Sorry, I got excited. This week I am bringing an old favorite, my version of a Western Omelette. I call it a Texas Style Omelette. First chop up jalapeno peppers, tomatoes and onions. You can add whatever you want. Sometimes I throw in bell peppers but I prefer the jalapeno …depends on what I have. Add a little olive oil or spray to a medium skillet heat on medium high heat; stir in your onion, peppers and tomatoes and saute’ until tender. Next cook up some bacon, I used turkey bacon and microwaved it. You can cook your bacon in a skillet, if you prefer, but I am a lazy cook! I won’t lie and besides I think the turkey bacon does better in the microwave. I don’t have a picture of this …I just plain forgot to take it. It happens! Combine your egg, salt, pepper and I used a dash of garlic salt in a bowl and whisk. Set aside. Add a little more cooking oil or spray back to the medium skillet, heat on medium high heat. Add egg mixture to pan, tilting pan to spread evenly; cook 1 minute or until edges begin to set. Lift edge of omelette with a rubber spatula, tilting pan to roll uncooked egg mixture to bottom of pan. Repeat procedure on opposite edge of omelette. Okay, so I lifted the omelette a little to high and now there is a bubble and my omelet no longer looks perfect. Probably another reason I don’t photograph step by step. But wait till you see the end result. Cook 1 minute or until center is just set. Sprinkle cheese evenly over omelette. Sprinkle bacon and vegetable mixture over cheese. I was a little distracted and by accident reversed the order and put the veges first …it was fine, but really the cheese should go first so it gets all melted and cheesy gooey. Run spatula around edges and under omelette to loosen it from pan; fold in half. Slide omelet onto a plate. Serve with your favorite toppings. I like mine with a little salsa or picante sauce. Or maybe a lot of salsa. If you are feeling the cheese please, then you can add some more cheese on top …there can never be enough cheese ever! Well there you have it. My omelette, “Texas Style” Oh so good! Now I just need some fresh squeezed Orange Juice. Ahhh …that’s the stuff. Coat skillet with cooking spray or oil. Heat medium nonstick skillet over medium-high heat. Stir in onion, peppers and tomatoes; sauté until vegetables are tender. Remove vegetable mixture from pan; set aside. Cook bacon as directed. I used turkey bacon and microwaved it a minute per slice. Combine your egg, salt, pepper and I used a dash of garlic salt in a bowl and whisk. Set aside. Add a little more cooking oil or spray back to the medium skillet, heat on medium high heat. Add egg mixture to pan, tilting pan to spread evenly; cook 1 minute or until edges begin to set. Lift edge of omelet with a rubber spatula, tilting pan to roll uncooked egg mixture onto bottom of pan. Repeat procedure on opposite edge of omelette. Cook 1 minute or until center is just set. Sprinkle cheese evenly over omelette. Sprinkle vegetable mixture and bacon. Run spatula around edges and under omelette to loosen it from pan; fold in half. 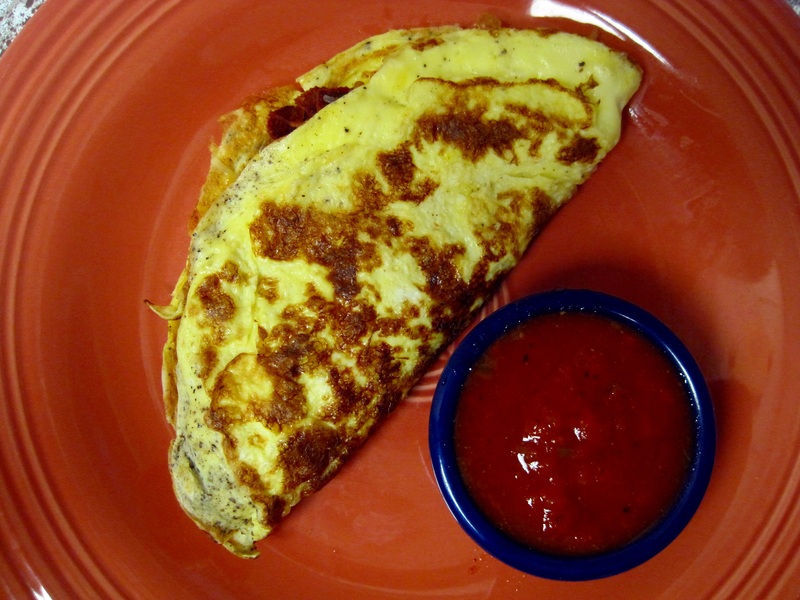 Slide omelet onto a plate. Serve with your favorite toppings. It was really actually fun. So yes, I am going to try to make it one! Thanks so much for the support! Texas omelette? Yee Haaa! Happy Fiesta Friday! You lost me with the bubbles thing? Bubbles to drink? It is ff18 after all! LOL, thanks Sue! Happy Friday to you! Thank you! 🙂 Happy Fiesta Friday to you! Haha Jhuls! 🙂 Thank you! Happy FF18 to you as well! There you go again !!!!!! You certainly know how much I love to see all of the good food in your blogs!! What I challenge I have!! I can eat only so much salad.!!!!!!!!!!!!!!!!!!!!!!! Haha! 🙂 Okay, I will only give you a 1/4 of the omelet then …and no extra cheese for you! Hehe 🙂 Have a blessed day!! May I say that you are extremely kind to us who are calorie challenged? Definitely a Texas style omelette! Nice! Your roommates must have loved it when you would make it for them! Wonderful addition to Fiesta Friday Arl! My kind of omelet! I’ve cooked something similar, but never with the jalapenos… I’ll have to try that and I like pico de gallo! Thank you so much! I hope the move goes well and your family enjoys living here in the south. 🙂 Thanks for visiting!! Love this, Arlene! I love weekend breakfasts too and will be giving this a go soon! Thanks for sharing – happy FF! Yum, yum, I’ll have mine with lots of picante sauce! 🙂 What a great way to start the weekend! Here you go! I put a little extra on yours. 🙂 Thanks so much for stopping by! You are welcome! I hope you enjoy. Thanks so much for stopping by and commenting! A recipe with no sugar. Yehey says one pre-diabetic viewer!